Flags for Veterans for Peace surrounded a statue of Samuel Adams. When the members of the Veterans For Peace returned home from combat — which, in most cases, was decades ago — they didn’t know that what may be their longest-running battle was in front of them. 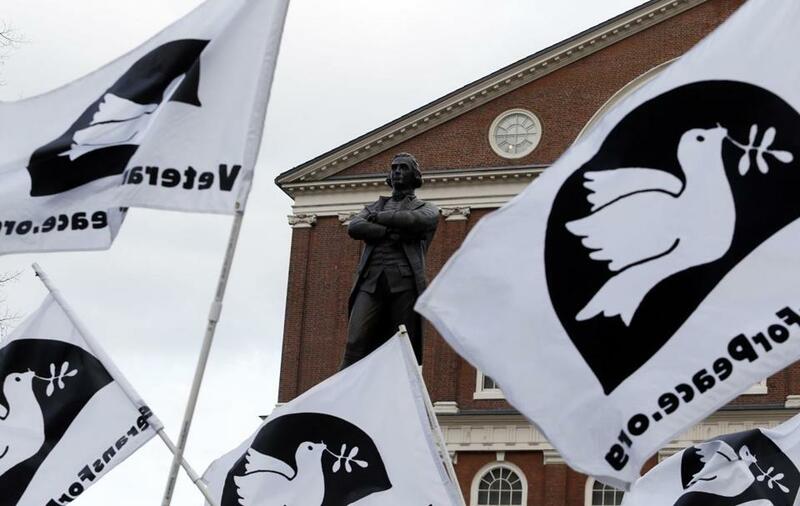 They are a pacifist group of soldiers, sailors, and Marines (they strongly object to the term “former”) who have struggled for years to win approval to march in the St. Patrick’s Day Parade in South Boston, with no success. The multiple indignities they have suffered have been well-documented. After being rejected year after year, they held their own counter-parade, on the same Sunday as the official parade. It traveled along the same route, but began after the other parade had ended, and after the crowds had begun to disperse. They got the drunks, they said, without the attention. This year, they thought they would finally be allowed in. Police Commissioner William Evans, a member of a revered Southie family full of distinguished military veterans, personally went before the Allied War Veterans Council, which organizes the parade, to argue their case. Evans thought he had persuaded the room, but no. The veterans have been shut out again. That is an outrage. According to parade organizers, the veterans have been rebuffed from what is officially a celebration of the military because they are a “protest group.” There is some truth to that: they do protest war, from the perspective of people who have participated in it. In a celebration of military might, there is apparently no room for people who question military action, even from those who have fought for their country. This parade might well be the most litigated in American history, and much of that litigation has been about the right to keep people out of it. Organizers have won those battles, but at the expense of reinforcing a reputation for intolerance and insularity that much of South Boston desperately wants to shed. Evans is among those who believes it is far past time to move past this controversy. Policing two parades was an unnecessary headache, he says, and he wants the sides to find a way to coexist. He brokered a deal in which the veterans agreed to concessions proposed by the council, only to be rejected anyway. In lieu of marching in the parade Sunday, Veterans for Peace will hold a silent protest in front of late member Tony Flaherty’s house on East Broadway, along the parade route. Flaherty, a 27-year Navy veteran and lifelong South Boston resident, spent the last years of his life fighting his fellow veterans for the right to be in their parade. He would tell you in no uncertain terms that no one was more of a veteran than he was, and who did they think they were to exclude him? His chief antagonist, longtime parade honcho John “Wacko” Hurley, had been one of his best friends in the neighborhood growing up. They parted company when Flaherty became a pacifist. Both men died last year. But the war over peace that estranged them rages on.